ABOUT 25 security guards were absent from their regular posts yesterday morning but they were not skiving or on strike. 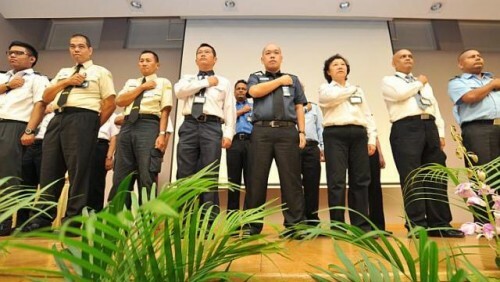 Instead, they were taking part in the inaugural "security officers day". The Security Association of Singapore (SAS) picked yesterday - July 24 - to honour security guards because they work round the clock, or 24/7. Speaking at the event, SAS president T. Mogan said security guards were not people who were unsuccessful in joining the police force. "You protect and save lives," he said. The move to recognise the contributions of security guards comes amid a severe manpower crunch in the sector. Industry players estimate that some 50,000 guards are needed but only about 40,000 are currently working. While there are more than 66,000 unarmed security guards licensed by the police, many of them do not take on work because of the long hours - it is the norm to work 12 hours a day, six days a week. At yesterday's event, held at the Regional English Language Centre in Orange Grove Road, the 25 guards took a public pledge to help the police protect lives and properties. They also recited the national pledge ahead of National Day next month. Speaking at the event, SAS patron and Deputy Speaker of Parliament Charles Chong said security guards need to upgrade their skills to keep up with the demands of the job. The event was attended by 200 guests, including staff from security firms, and officials from the police and Manpower Ministry. A source said the event does not have the support of the National Trades Union Congress and the Union of Security Employees but declined to say more. An NTUC staff member and union leader, who was at the event, declined to speak to The Straits Times, other than to say he was attending in his personal capacity. Last year, the SAS had a public spat with the NTUC. Although the association had openly objected to NTUC's move to raise the pay of security guards at the time, Mr Mogan said SAS is now in line with NTUC's plan. There are plans to hold the event every year but security firm Globalmax owner Baljit Singh said more can be done. "For instance, we can also consider doubling the pay for security officers who work on that day, since it is a special day," he said. Retired accounts assistant Ho Siew Lan, 64, who has worked as a guard for four months, said security officers deserve better recognition from the public. "Sometimes they look down on us and don't recognise the work that we do," she said. "I feel uncomfortable and discouraged sometimes but I'll keep doing the job because security guards play an important role," she added.